“Believe in deeds and not just in words, In the acts we see who persons are. In words we see only who they would like to be.”Parting two lovers is a crime you should not sign up your name to.Haidji is a writer of a caliber that is extremely rare to find. The ones that tell you a story by singing it.She slowly places brick after brick of the scene buildup - almost as if she were writing a script. The music that is playing, the direction of the wind, the feel of a touch.A girl is lost. And has lost the love of her life. Can she find it? Are true lovers true to their soulmates? Do they see the guiding light and follow the path that leads them back to the one person that matters?When two people go apart, the sadness engulfs them both. There are no winners in separation.The heartbreak of Ines is so powerful and Haidji manages you to transport you to the era, make you feel what Ines and years later what the girl feels as she waits for happiness - all in a matter of mere 56 pages.She paints the picture to you, making you hold the paintbrush and move your hand along the canvas. Guiding you at the right places to give your imaginations wings but also placing a check on the direction they follow.Well, that is how the book is. You will interpret it in your own style. You'd enjoy the magnanimity of her work but let your creativity draw you pictures.Poem blended into stories in the sweetest manner literally possible.A beautiful, beautiful work.Although there are many great stanzas, one in particular stuck in my mind and I want to bring it out with my heart's voice. It goes somewhat as,If I knew what to sayI would say to youAll I feelIf I would know what to doI would do it for youAll I wantIf I knew how to loveI would love only youAcross the whole universe.A talent of finest order.First Haidji book and definitely not the last. Charismatic! A voyage that I'll never forget. Written in poetic style and having a heart of their own, Haidji's books are nothing but remarkable. An extraordinary tale by Haidji, once again.Haidji's books are so amazing that you would want to read it multiple times. Her poems are something I can't get enough of them. Time to time, I would come back to its pages and their magic.Ines' World is the story of tragic and ever lasting Love between Ines de Castro and King D Pedro I. A quick read with a powerful impact. This is another great story written by Haidji. I love the way the words she uses string together so lyrically. This is beautiful. Parts made my heart ache, I truly felt this story with every feeling imaginable. I can think of no other way to describe this than to share an excerpt:Believe in deeds and not just words.In acts we see who persons areIn words we see onlywho they would like to be.Believe in those who make you smileand not in those who just smile at you.Those will leave you crying aloneafter you wiped their tears.For as they did not see your smile.They will not see your tears.But only their own tearsand their own smile.They smiled at Ines, and then they killed her.They ignored her tears.They did not think about her children.Driven by conveniences.In a world where there was no room for love.Her tears fell and gave rise to Tears Fountain.Love?Love fell with her,touched the ground, took root and wasreborn, as the Tree of Love. "This begins with a brief telling of the tragic love between Ines de Castro and King d Pedro I. The present swirls and intertwines with the past, their story.Book won in LibraryThing giveaway. I agreed to review in exchange. Ines's Words!!! First things first: I won this book in a giveaway on booklikes. Currently I'm in a bit of a reading slump. Or was? I don't wanna jinx it. So when I got this in the mail yesterday I knew I would start it right away, cause it is a really short book and because I just love the stories that Haidji writes. And it worked. Here is what the story is about:The love story between Ines de Castro and King D Pedro I is one of the most tragic, intense and powerful in European history. Their story has become a legend and it is difficult to separate fact from fiction, where the only certainty that remains is the element of forbidden, but everlasting, love. With her latest work, Ines' Words, Haidji brings her unique and magical style to this subject and shows not only the enduring power of the legend, but of love itself. Once again the writing in this little story was so beautiful and poetic and I'm just in awe. I reread it this morning, just to experience it again. There are so many quotes in their that I really loved. The love story between Ines de Castro and King D Pedro I in one of the most tragic, intense and powerful in European history. Their story has become a legend and it is difficult to separate fact from fiction, where the only certainty that remains is the element of forbidden, but everlasting love. This book is very short and begins with a brief retelling of the tragic love story between Ines de Castro and King D Pedro I. The rest of the book is mix of present and the past. This book is very lyrical; it is a mix of story telling and poetry. This is the first book I have read from the author, but she has a very beautiful writing style and her words flow very well. The reason for the 3 stars, instead of 4, is that it's just not my style. The book is only 47 pages long and half those pages are poems. While it is beautiful, I am just not a big fan of short stories (except for Stephen King). I was sent a copy of this book by the author in exchange for an honest review. it is a short story of Love itself compressed within 50 pages.I received a physical copy of the book from the Author in exchange for an honest review. the intro tells about Ines do Castro and Kind D Pedro I's undying love and how that one love evoke myth and superstition that can set of a chain of events in different times with different people. The book has many places where the writer chose the form of poetry to convey the meaning behind simply everyday life acts that mean so much more than just that. It is one of those short books that I will most likely come back to from time to time when I need a breath of fresh air from the polluted chaos of my own reading habits. I its a quick read but very impactful and does stay long after being read with the reader. I read this today outloud to myself and it's beautiful. Pedro and Ines Love each other. How can his father be so cruel to tear them apart by killing her! It's so emotional. Ines and Pedro are brought back in the form of Joseph and Marianna. True love i say. When i read this, i feel the story is in a poetry sense and it touchs my heart, tugging it strings. I love this book! Enjoyed it even. A journey of spiritual, emotional unconditional love. I'm looking to read more books from haidji.I received this book for free through Librarything in exchange for a honest review. *I was sent a copy of this book for an honest review; and that's what you'll get ♥*I am sad to say that this was my least favorite of Haidji's books, usually she can cram so many emotions and ideas in short lines, and her words were poetic and lively, and this "splash of creativity" that i like to think of as "Simply Haidji" but i didn't find it in this book , it lacked the uniqueness of her works, and i found it very plain.i look forward however to reading more of her works. Ines' Wordsby HadjiHadji revisits the love shared by King D Pedro I (1320 - 1367) and Ines de Castro (1325-1355).She weaves a modern day tale around their tragic 14th century love.Offerings of her verse are interspersed with the story.The presentation is lovely, verse well chosen and definitely thought provoking.Although this is not something I would normally read,I'm pleased to have had the opportunity to enter Hadji's world. This beautiful story reads like a long, romantic poem about lovers destined to find each other again in a future life. I felt the aching sense of longing as the main character searched for her eternal lover in this deeply emotional piece of work. The author's writing feels sacred, somehow. I have read twice already, savoring each word. I'm sure I'll read it again in the future. Ines' Words would be a wonderful candidate for a poetry reading. A real treasure in this day and age! "Until the end of the world". That is how Pedro defined how long he would love Ines. Could it be that Mariana and Joseph are really Ines and Pedro finding each other again to simply live out their love until the end of the world? One could hope.Simply a beautiful story of love and loss. It may be a short story but you get lost in the words and it stays with you long after you have read it. Događaji na kojima se zasniva ova knjižica spadaju u jednu od najtragičnijih ljubavnih priča kroz historiju. Ines de Castro postala je dvorska dama portugalskoj princezi Constanci 1340. godine. Princ Pedro, nasljednik portugalskog trona, u međuvremenu se zaljubljuje u nju. Nakon što je njegova supruga umrla na porodu 1349. godine, Pedro je pokušao oženiti Ines, ali njegov otac - portugalski kralj - iz političkih razloga nije odobrio brak i protjerao ju je iz kraljevstva. Pošto to nije spriječilo Pedra u njegovom naumu, poslao je tri čovjeka da ubiju Ines. Pedro im je kasnije iščupao srca vlastitim rukama i nakon očeve smrti imenovao Ines svojom “Mrtvom kraljicom”. Mariana je djevojka koja se skoro 700 godina nakon ovih događaja nađe na mjestu gdje je ubijena Ines, čuje njen glas i osjeća njeno prisustvo. Haidji pokušava da njeno pisanje bude nešto novo i neobično, pa djeluje pomalo pretenciozno, ali sve u svemu, simpatičan kraj. * I received this paperback copy in a giveaway on Library Thing. I think that the original story on which the book is based on, is quite unique and powerful. Haidji has set the story quite beautifully and those lines go by swiftly in each passing word. Beautiful words! Good writings! I like it!Given for an honest review. I would like to thank the amazing author Haidji for this lovely gift! She was so kind to send me a free copy of this BEAUTIFUL book that I will always keep with me in my heart. I did not know what the book was about but as soon as I started reading the introduction, I fell in love with it straight away. Actually I fell in love even before, when I have read the author's dedication: "This book is dedicated to all lovers in the world and beyond it, to all who, no matter what, never gave up to believe in love". How amazing is this sentence! I would have given 5 STARS even before starting reading the actual book, but honestly after I finished it, I wanted to rate it even 6 stars! It is such a heartbreaking, compelling and shocking story about the true love between Ines de Castro and King D. Pedro I.I have to admit that I didn't know this beautiful and tragic love story but I am so grateful that the talented author Haidji gave me the chance to read it. It is a story blended with one of the finest poems I have ever read. When I was younger I used to consider poems very boring, but growing up I understood the beauty of it and thanks to authors like Haidji and their talent, I can appreciate this gorgeous art. In few sentences Haidji is able to express such beautiful concepts and at the same time she is able to tell us a story making us feel what the characters actually felt. The book is very well written and even if English is not my mother tongue (I am Italian), I did not have any problem reading and enjoying this Amazing story. I am always attracted to books that have a tragic, intense and unconditional love; that kind of love that overcomes everything and everyone; the real everlasting LOVE. And this book is a perfect example of it.Haidji thank you so much for writing this book. This is a wonderful book that is poetic and beautifully written. It is also a great history lesson written by a very talented poetess and historical writer. You will want to read it again and again like I did. It is that good!The first thing that struck me about Ines’ Words was the historical perspective given at the beginning of the book. The author, Haidji, obviously did extensive research to be historically correct and to allow us to learn from the past. It is unique and a refreshing, genuine approach.In the past, specifically in Portugal in the 1300’s we are told about the royal family’s intrigues and the murder of an innocent victim.We meet another version of Romeo and Juliet where Pedro (King D Pedro 1) meets Ines who is “the lady in waiting” for Constance his wife through an arranged marriage. The problem is Pedro has fallen deeply in love with “the beautiful Ines” and ignores his new wife. This infuriates his father King Afonso IV who first exiles Ignes and then orders her murder. Then comes revenge and so much more.We are then transported into the future to 2020 and the rest is an exciting love story and history. And everlasting love.You will love this book and emerge treasuring both poetry and prose, the past and the future. 5 Stars! The reviewHaidji brings a unique a style to the love story between Ines de Castro and King D Pedro I. She writes in a present day style of poem. Here is a small excerpt listed.“Believe in those who make you smileand not in those who just smile at you.Those will leave you crying aloneafter you wiped their tears.”As you can see this is truly beautiful and something to be beheld. This writing style is eloquent, that you are brought to every emotion as you read along. You will truly feel the words as you see each one before you. You are immersed into this story and are surrounded by the beauty and sadness of this tale. I truly loved every part of this. Thank you librarything for sending me this book in exchange for my honest review. Haidji......just Haidji, sounds simple ,yet she is simply intricate, Her ability to put into words the kaleidoscope of ideas in her head, her ability to tell a story so sparingly is dazzlingly meaningful. I don't think that any review could do this slim volume justice.All i can say is read it. Put it down and think about it. Give it time and re-read and you'll come away mystified with her use of words. Simple.Favorite line: "The Silence that says everything by telling nothing." I was so glad to discover the story of these star-crossed lovers, the 14th century Portuguese king D Pedro I and Ines de Castro, a lady in waiting of his wife. This slim volume was a lyrical prose-poem relating their story to that of Marianna, a woman in 2020. Is she Ines's spirit searching for her Pedro? I thank the author for sending me a copy. I really loved this book! Being a portuguese I found interesting to see that there are people who know who Pedro and Inês were. The story is inspired in some way by the love of these two. Mariana is searching for her Pedro and that search show us what Love is. Thank you Hadji for this story that reminds us that true Love exists and even Time can't erase the Love btetween two souls! Such a great book! Beautiful writing, could not put it down again. I will definitely read more by this author. A marvellous book where the words were like colours painted on a canvas. It was beautiful and dreamy. I enjoyed every part of this lovely book. Such a refreshing read it was! This was a tragic love story well-written. It is a unique style combining prose and poetry. Easy to read and very enjoyable. For more reviews, check out my blog Craft-CycleBeautifully written in Haidji's characteristic style. I enjoyed this short book. This one is especially musical and melodic. A simple story, but a very intriguing one. I really love Haidji's descriptions. One of my favorites was:"Was left in the room,in Silence.The Silence that says everything by telling nothing. "Nicely written. tale of forbidden love, the writing was powerful! It touched my heart.Good read!! Powerful, poetic and beautifully written...Royalty doesn’t get you everything it seems. It’s a well known fact, that when it comes to royalty or aristocracy, you rarely marry for love. More often than not they are usually arranged by the respective families, having their authority, affluence and general interests in mind, with the bride and groom having little or no say in the matter. Since these political arrangements were essential in the power plays (both past and present), there is no room for love. In the case of Prince Pedro of Portugal and Lady Inês de Castro, they were willing to defy these notions. However, not even a King’s forbidden love was safe from destiny’s cruel designs or the court’s cruel plots. But all is not lost in this powerful, poetic and beautifully written story. The reader is transported into the future where the author creatively and artistically links both worlds between the life of an ordinary woman, Mariana, with the eternal love of Inês and Pedro. To say any more would be giving spoilers away, so you’ll just have to turn the pages for yourself to find out!Author, Haidji, writes with a delicate and imaginative touch. The story was elegantly rendered, beautifully drawn, lyrical and yet thought-provoking. 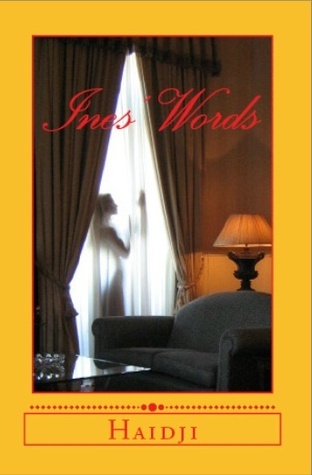 Ines' Words unfurls in small acts, at first feeling slight to touch, then building in emotional substance. Into the spaces between the words, the author breathes a pulsating intensity that rolls between the old and new worlds.This book with take you on a mesmerizing journey that will stay with you long after you have turned the last page. A book which has been beautifully written and is ultimately a book you simply can’t put down. I, for one, feel all the richer for having read it. There’s no doubt that this author is uniquely talented and I’ll be looking forward to reading more from her in the future. Find my book review here: https://theroyalpolarbearreads.wordpr...The ending of this book – I didn’t expect it to be that way. I love it. Actually, I was hooked by the introduction of the book and the line that has been said, “Until the end of the world.” And I really think that the line is so much sweeter and has“Until the end of the world.”And I really think that the line is so much sweeter and has a deeper meaning when you are pertaining to your love one than “I love you.” Haidji has this way of knowing what kind of feelings she wants her readers to feel. I couldn’t comprehend nor describe what was – am feeling right now regarding the book. The cover may not seem that enticing but it was interesting enough to read. With the author’s break with this book, I am definitely going to read her works! You couldn’t imagine how fascinated I am right now and find a book to read about ‘The Death Queen.”MY RATINGS: 4.5 STARS.